The first stationary theater was founded in Belarus in 1933 on the basis of the Belarusian opera and ballet school. The list of brilliant performances staged in the theater was opened with Bizet's Carmen. During several years the troupe had been growing and was increased by several high professionals and soloists. «The Swan Lake», performed by K. Muller, was the first performance, showed at the scene of the new theater building. Theater's performances at the Decade of Belarusian Art in Moscow turned to be a great success. The theater didn't stop working even during the war (it worked in Nizhny Novgorod till Minsk Liberation in 1944, than in Kovrov). During this time the repertoire was enriched greatly. The most famous operas staged in this theater are «Boris Godunov» by Mussorgsky, «Othello» and «Don Carlo» by Verdi, «Hoffman's Fairy Tales» by Offenbach, «Sadko» and «Golden Cockerel» by Rimsky-Korsakov, «Lohengrin» by Wagner and many other masterpieces of the world art. Nowadays you can see new interpretations of classical plays like «Carmen» and «Boris Godunov» as well as traditional performances.The theater tours a lot and is welcomed in many countries all over the world. In Spain, Russia, Germany, Poland, Switzerland, Israel, Portugal, China opera admirers are well acquainted with the repertoire of the Belarus Theater. The theater's p articipation in the well-known annual festival in Germany called Classic Open Air has already become traditional. 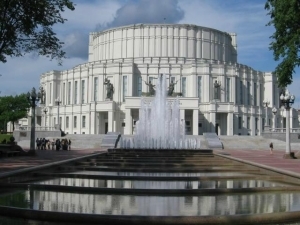 It should be mentioned, that in 1996 State Theater was divided in two independent theaters: National Academic Bolshoi Ballet Theatre of the Republic of Belarus and National Academic Opera Theatre of Belarus.